With 75% of the Worlds reefs threatened from loss and degradation of habitat, increasing pollution and overfishing, the survival of these corals reefs and their fish are in our hands. A visit to the Rainbow Reef exhibit allows a small glimpse of the wonder of life in these majestic coral reefs. After the hypnotic Kelp Forest exhibit at Ripley’s Aquarium of Canada you enter a colourful paradise called the Rainbow Reef. From coral reefs and their tropical fish to reef sharks and interactive exhibits, join me as I take you on a tour of the kingdom of the coral reefs. 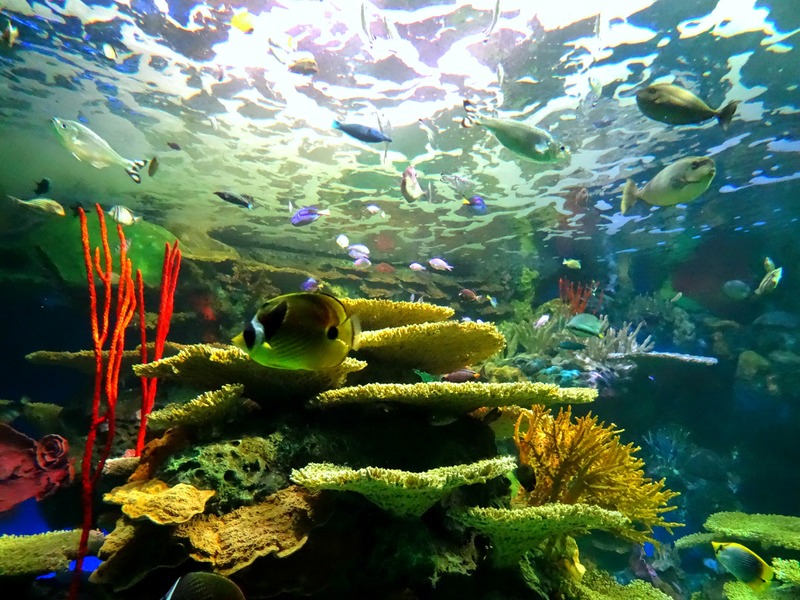 The Rainbow Reef exhibit contains over 200,000 litres of water and is home to over 100 species of fish. The exhibit also boasts a dive show where divers communicate with microphones to the visitors outside the tank. The exhibit represents the warm Indo-Pacific waters, a display of the brilliant coloured corals that make up the kingdom to some beautiful and vibrant tropical fish. What are corals? Many think of corals as plants or rocks, but corals are actually made up of invertebrates called polyps that are small and large and group together to form colonies. They use calcium carbonate from the ocean to build a protective skeleton. Corals make up less than 1% of the ocean floor but support an estimated 25% of ocean life. Those figures astound me! The Indo-Pacific reefs contain roughly 200 species of coral and around 3000 different kinds of reef fish. Here at the aquarium you are immediately drawn into this magical kingdom of high Definition colour and wondrous fish with names like out of a fairy tale, like the comical green bird mouth wrasse, with its elongated snout-like mouth, and the unicorn fish with a piece that protrudes from their foreheads. Of course, every kingdom needs an emperor angelfish, these large fish with striking colours of blue and yellow stripes and a black mask appear noble in their appearance. To me the jesters would probably be the long nose butterfly fish with their startling bright yellow colouring, slender bodies and literal long noses – yet who are surprisingly monogamous. 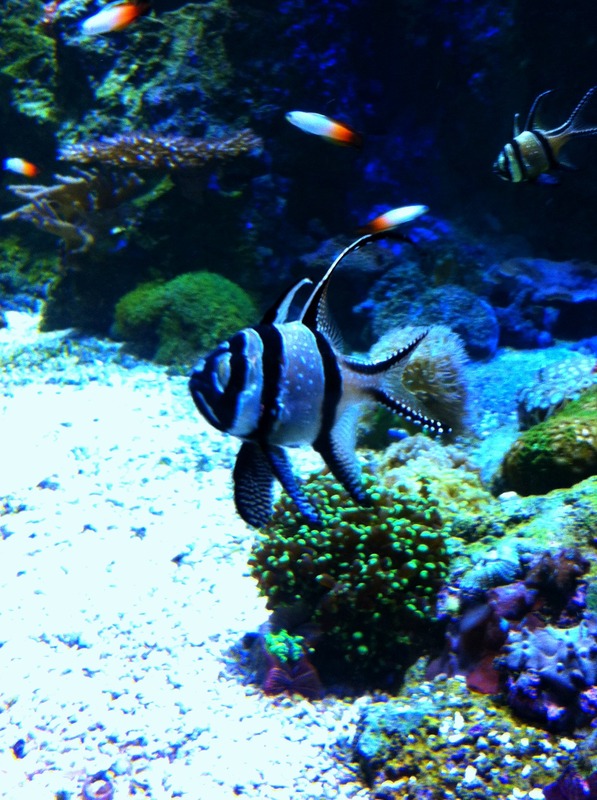 One fish that really struck me was the Banggai cardinal fish – of which I’d never seen before, nor heard of. The Banggai cardinal fish are an endangered species that form groups and are small with black and cream coloured stripes with delicate yet beautifully regal fins. Amazingly the males incubate the eggs in their mouth for up to 30 days, during which time he doesn’t eat. Remarkable parenting and dedication! The Reef Sharks exhibit showcases some of the smaller species of shark that call coral reefs home. One being the determined an easily identifiable – blacktip reef shark that grow to an average of 5.2′ (1.6 metres) and are wide-spread and prefer shallow waters in and around reefs. One of my favourite sharks is also found here, the nurse shark. I love the elegant movement of the nurse shark with their sweeping tails. Nurse sharks also inhabit shallow waters around sand flats and reefs. These nocturnal sharks average lengths of 10′ (3 metres) and weigh 730lbs. (330kg). A great highlight of this exhibit is a tunnel that children and the child-at-heart (like myself) can crawl through where the sharks are swimming all around you as you crawl over the coral reef below. No need for a behind the scenes tour here, as Ripley’s Aquarium of Canada brings the behind the scenes to the forefront in their Discovery Center. Here you are shown the “guts” of what helps to create a good aquarium – large, massive tanks that regulate, purify and are the backbones for every aquarium within the building. One thing I found extremely fascinating was the LED screens that showcased every exhibits temperature and other stats. It was interesting to see the differences like the Great Lakes exhibit’s temperatures were 13 degrees Celsius while the Rainbow Reef was 24 degrees Celsius. The Discovery Center is also a great place for children to blow off some steam while learning. There are two pop-up tanks, where you go under and emerge in the middle to be surrounded by some amazing fish like cute porcupine fish and puffer fish in one and another full of colour and ‘Finding Nemo’ favourites like the clown fish, blue and yellow tangs as well as the stunning royal gramma with its vibrant colours of purple fronts and yellow tails. 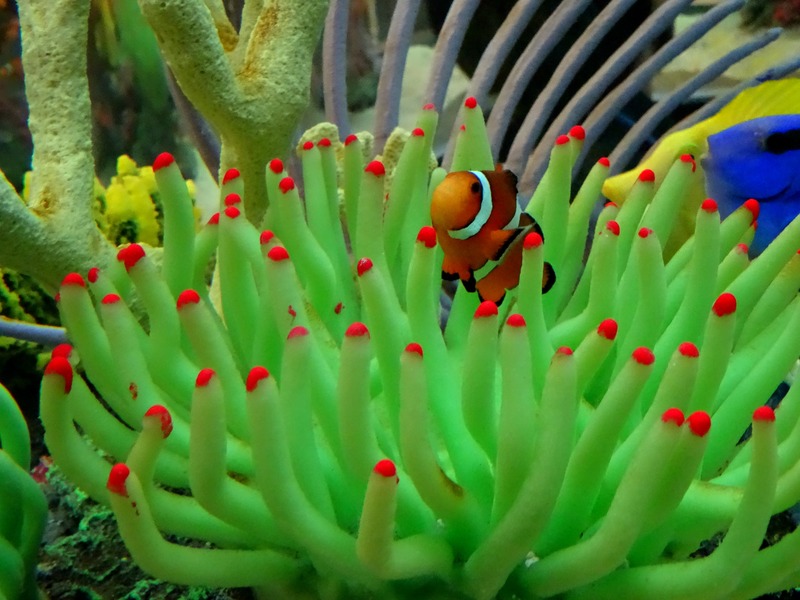 Most people, especially those with young children, when they see clown fish they think of the cute, curious wandering fish of ‘Finding Nemo’, but to me I always think of their wonderful relationship with anemones. This relationship is called symbiosis, where each get something from their relationship with one another. While the anemone protects the fish from its predators the fish defends the anemone from its predators as well as parasites. Also here at the Discovery Center you can see a habitat view of the Dangerous Lagoon, or play with the tsunami simulator – using a turn dial to create the waves that come ashore and knock down structures. One of the best exhibits in the Discovery Center is the horseshoe crab touch tank. Here you can gently pet these live fossils. Horseshoe crabs have been around for over 450 million years and primarily live in shallow ocean waters. They may look like crustaceans but strangely enough are more closely related to arachnids (spiders and scorpions). Whether you’re enchanted by the majesty and vibrant colours of the Rainbow Reef and its characters or prefer to stimulate your mind and senses in the Discovery Center, Ripley’s Aquarium of Canada has something for the curious and playful of heart.